Studies show that there are many plant-derived compounds that affect cell proliferation and stimulate cell growth. 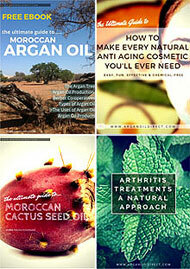 Natural plants, herbs and oil, such as Argan Oil, have long been used for their beneficial effects on skin health. This is why many drugs and an ever growing number of cosmetic products use natural plants and extracts in their formulations – because they work. Of all these oils are the most convenient way to apply a natural lotion for stretch marks. 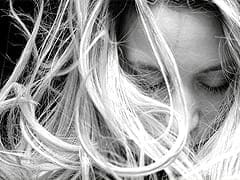 The middle dermis layer of your skin is made-up of strong, inter-connected fibres which allow skin to expand and contract. However, a rapid stretching of the middle layer of skin may cause it to break or tear, allowing deeper skin layers to show through and this produces stretch marks. Our goal is to improve elasticity, reduce inflammation, prevent dryness. Improving skin elasticity allows your skin to stretch without tearing. This is where Argan Oil can be of such help. Collagen is also an important component of skin elasticity which can also benefit from treatment with a combination of Argan Oil and vitamin C.
Applying this Argan to your skin has the ability to make your skin stronger regardless of your skin’s current condition. If you haven’t started seeing stretch marks, then the oil can moisturise and strengthen your skin dermis and reduce damage from stress as it occurs even from dietary deficiencies in essential fatty acid that affect your skin. If you are starting get stretch marks, then the increased anti inflammatory and cell stimulating nutrients should help prevent further stretch marks. In many cases continued treatment may help reduce stretch mark scars. 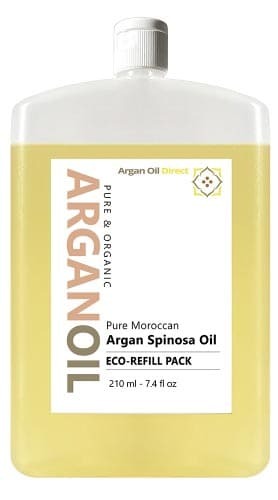 Pure Organic Argan Oil double filtered. An Argan Oil with almost no Argan nut smell. The best choice for skin care & hair. Is it Safe to use Argan Oil During Pregnancy? Argan Oil is almost certainly safe to use during pregnancy. 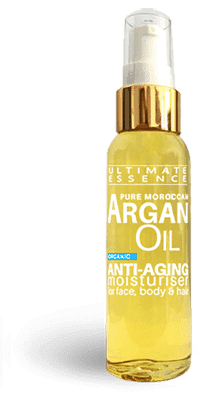 Although there are currently no specific scientific studies into this we Argan Oil has been used for many centuries by the Berber women of Morocco. They have enjoyed natural protection against stretch marks during pregnancy without reported side effects. Argan Oil is an Organically produced oil so no chemicals are used at any stage of the process. By comparison commercial anti stretch mark products often contain a long list of chemicals that may well have unknown side effects. Finally, since Argan Oil is often eaten for is health benefits it is probably safe to assume that Argan oil is safe to use when pregnant. One of the problems that rapid stretching of skin causes is dryness and irritation. So, before applying Argan Oil wash skin with a high quality, light, non-perfumed soap. To reduce dryness further do not use very hot water. After cleansing the skin apply Argan Oil directly to the area or into the palm of the hand. Use just enough oil so that you it is smooth and easy to massage the oil into the skin. After a minute or two you should find that any oily residue disappears to leave the skin feeling soft and refreshed. Pure Argan Oil can be used as often as desired. But most probably twice a day, morning and night should be sufficient. Ideally, start applying as skin first starts to stretch. After birth it is advisable to continue use for a month or two or until you feel skin has returned to normal. Skin can be damaged through stretching from many causes and not just pregnancy. In all cases, to reduce or prevent stretch mark, an externally applied lotion or oil and in pregnanct the correct choice of diet can make a big difference. You will often see stretch marks where there is rapid stretching skin. This could be through eating and weight gain. In these cases areas like the legs or stomach where fat builds up can form pale stretch marks and scars which may never heal even after your weight / fat levels return to normal. With intensive weight training muscle may be rapidly built up and cause the surrounding skin to stretch beyond its normal capacity. This again leads to stretch marks. Organic Argan Oil double filtered with almost no Argan nut smell. The best choice for skin care & hair. No one wants to live with long term stretch marks and scars. 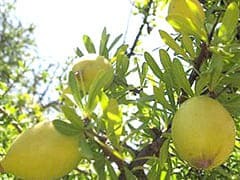 So, whether during pregnancy, during weight training or where there is a weight gain problem start applying Argan Oil immediately and protect your skin. It is simple to use and also helps relieve irritation and soothe stretched skin. Argan Oil is a wonderful, organic and safe anti aging, moisturiser. For stretch marks you will probably be using a lot more Argan Oil than for normal cosmetic use. 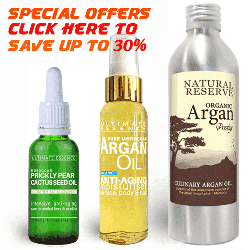 So save money with our special Eco-Refill offer of certified organic Argan Oil. You can buy directly from this web page where you see the “add to cart” button or click below to see all of our current specials. Please note that all our prices include Fast & Free Delivery Worldwide.